You must make reservations at least 5 minutes in advance of the time at Gravity Bar & Grill. 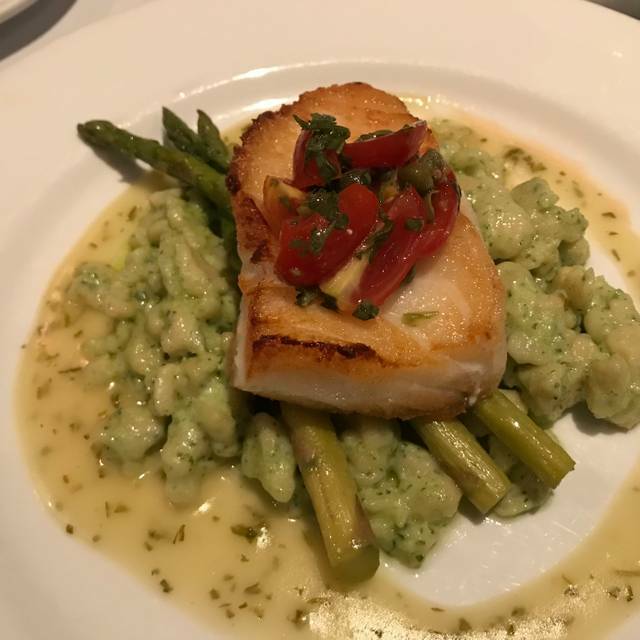 With contemporary, eclectic offerings of steak, fresh fish, pastas, and signature items such as the Lump Crab and Shrimp Cakes, Gravity is sure to draw you in and keep you coming back for more. We had another wonderful meal. Walleye was fresh and the dessert was wonderful. We always enjoy our trips to Gravity! The orzo was amazing, especially with the added delight of a piece of grilled salmon. Let yourself be pulled in by the Gravity! Food was just okay - well overpriced for the quality. Service was great though - server was very friendly and knowledgeable. Excellent as always (bar, service , food, ambiance - all as they should be). More of a classy small Restaurant than a bar and grill. Solid amenities, good food, good service. 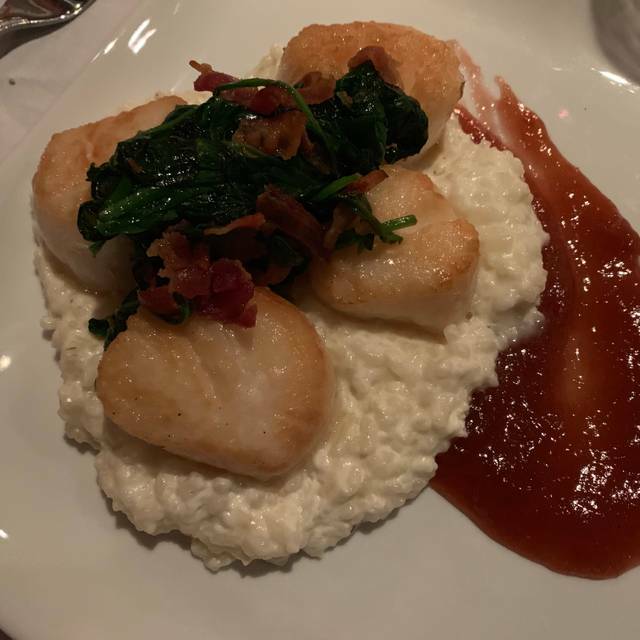 Spacial scallops with risotto were generous and delicious. Menu salmon with gnocchi were delicious with bacon, although it was a bit sweet (our server did inform us). Our guests ordered steaks which were done to their liking -and both said they were delicious (one had filet, the other enjoyed the evening’s special). Serving size was plentiful, so we skipped dessert. All in, 4 of us totally enjoyed our meal and service. Wine choice was available - always a good sign. Although it’s a distance for us, it’s worth the drive. Milford is a charming town and Gravity is worth the drive. Food is alway excellent as is th service. Birthday party for our daughter. Carrie was amazing as always, hand made birthday card and taking care of all the special requests. We choose Gravity when we want to celebrate. It never disappoints! Service was excellent. We enjoyed a special evening. Food was amazing, all four of our dishes knocked it out of the park. Debbie was great as always. The seabass and the swordfish were both excellent. my steak was very dry and not of high quality. My favorite place in Milford. Always a special experience! Excellent food and nice ambiance-not too noisy. We enjoyed a fabulous evening with friends for dinner! The food was fantastic, service terrific and all 4 of us couldn’t say enough complementary things about our whole dining experience. We’ll definitely be back! Top notch restaurant in quaint downtown Milford. Small dining and bar area but excellent service, food options and drinks. Perhaps the best hidden gem in the metro area. Specials every weekend that are always great too! Great food and service, thank you Carrie! Rare bourbons are to be found! Went for dinner on Saturday after thanksgiving. Unfortunately didn’t know that it was e only time they were open over the hol coz it definitely affected the experience. There were no specials , the cocktail were nowhere near the usual quality, actually had to send the Long Island iced teas back, which was crazy as usually they are some of the best made anywhere 😳. Some of the appetizer portions were reeeaaaly small, also not something ever had issue with before. Overall it was ok but disappointing as we were entertaining a family friend. Certainly felt like they had the second tier kitchen and bar staff in that day. Must say though that the server was fantastic, as usual. Smoky flavor added to some of the dishes was overpowering. We were there for our daughter's birthday by here request. Always has the filet. Came for a date night, first time trying this place. Camille was AMAZING! We were there about a half hour after opening and even though we were her only table she was attentive and courteous. She made recommendations on drinks, and desserts. Steak and potatoes were cooked perfectly (and actually medium!) but I felt the price was a little high for the dish. My husband had the salmon which was also really good. Salads were fresh and great too. 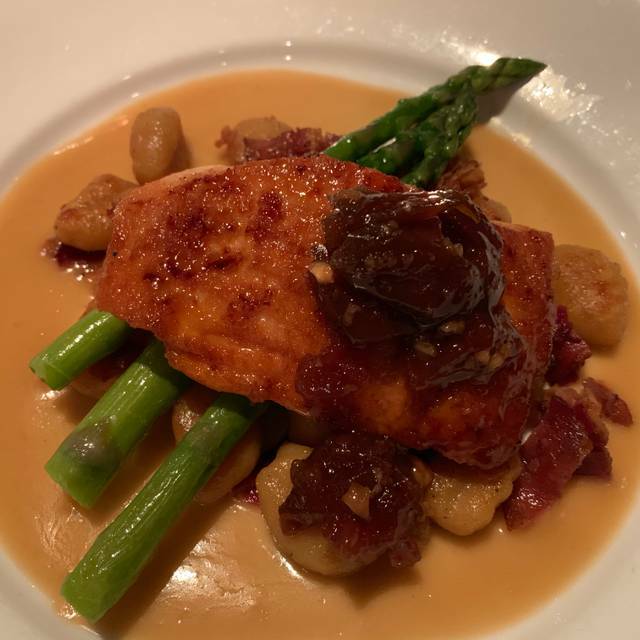 Worth the drive, and we would definitely come back for another date night or special occasion. We celebrated our 50th Wedding Anniversary, and it was a lovely dinner! Food was delicious and well prepared. Staff was attentive, but did not hover. The duck breast and shrimp/crabcakes were both wonderful! We had a nice dinner for two and enjoyed it from start to finish! Gravity Grille never disappoints and the service was outstanding! Great little restaurant, food was delicious. Only issue with ambiance was there was a strong odor when we walked in, with the odor dissipated, or we got used to t, but it wasn’t as prevelabt toward the end. The food was delicious, and our server was awesome, we would return for more special occasions, but probably not for regular meals. Our dinner was delicious. Service was good and we would definitely go back again. I had the Sea Bass special and it was so good! Just delicious. My husband’s dinner was delicious as well. He had a filet special and it was cooked just right. It is a small and intimate restaurant that is just right for a date night or special occasion. The staff is friendly and awesome! Loved it. First visit to this little gem in downtown Milford, MI. Excellent service! Brilliant food, but just a little pricey. The food was outstanding. The woman behind the bar didn’t have the best personality, but the food made up for it. Excellent Chilean sea bass and scallops. Great service and food....everyone was very pleased. Had a res and was sat immediately upon arrival as our table was ready. We were soon greeted by the wait staff. NY Strip special was awesome as was the Sea Bass; desert was also top notch. We'll all be back! Wednesday lunch with friends and restaurant was nearly empty... but we enjoyed excellent service, quiet surroundings and very good food. I ordered crab sandwich and was impressed with fresh taste and quality of the ingredients. Mushroom soup was also very good and served in a heated bowl... the way it should be. We enjoyed the cocktails and the visit from Jimmy! Happy Fourth of July! Great server. Great food. Only good things!